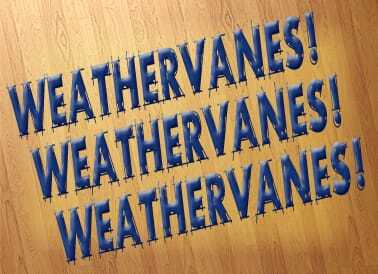 Perfectly sized for smaller buildings, garages and sheds. 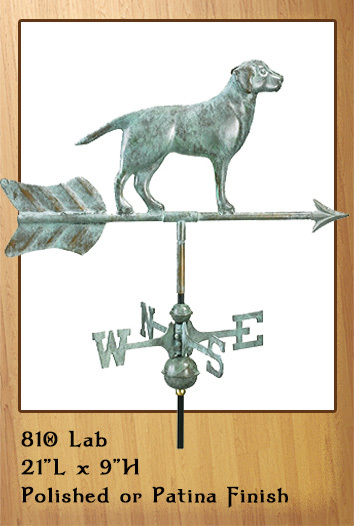 The weathervane includes mounting for rooftops, gardens or decks. 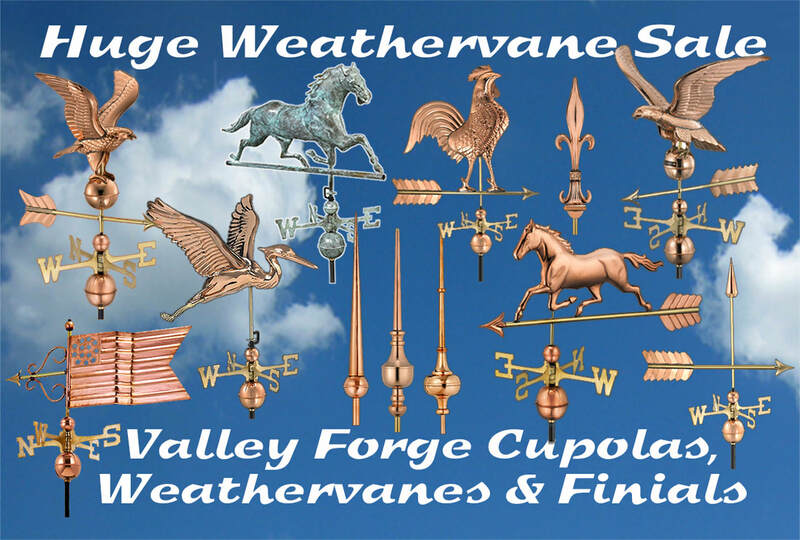 These smaller sized weathervanes go on 24" or smaller cupolas. 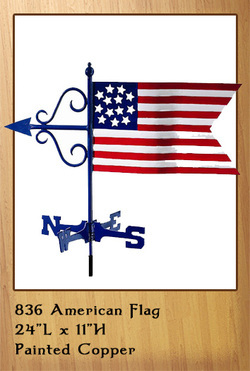 They will also look terrific on a garden pole on your lawn or yard. 1. 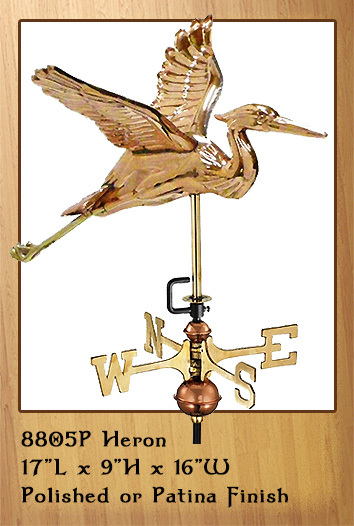 Heading away from its marsh pond nest, this cottage size Blue Heron is ready to perch on your roof. 9. 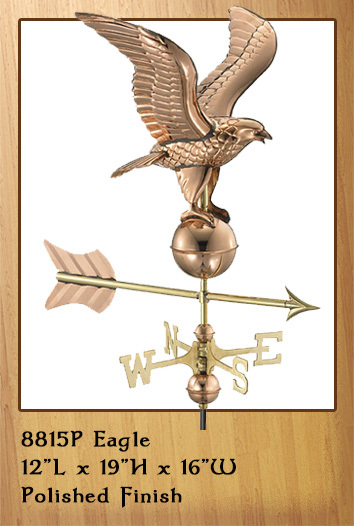 The American Eagle serves as a beacon of life, liberty, and the pursuit of happiness. Call 866-400-1776. 6. Another stylish regal Eagle with outspread wings is ready to soar. 10. 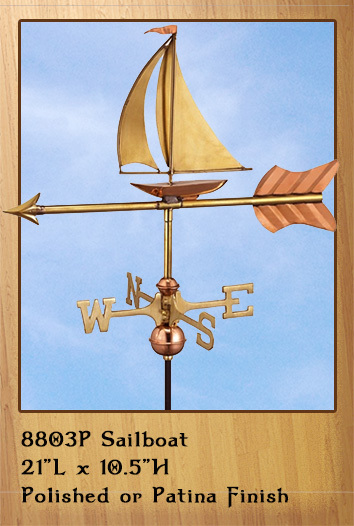 Distinctions in what constitutes a sailing boat and ship vary by region and maritime culture. 7. 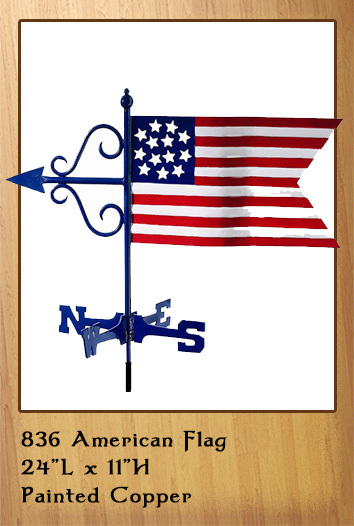 Show off your patriotism when this flag adorns the rooftop of your home, garage, cupola, or gazebo. 11. 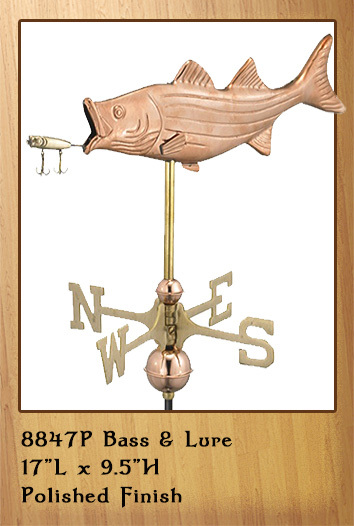 Lure this cute bass weathervane right on to your roof or cupola. 4. 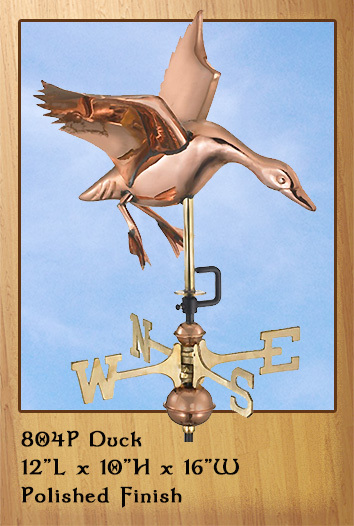 Another flying duck copper weathervane with an elegant arrow as it glides through the sky. 8. 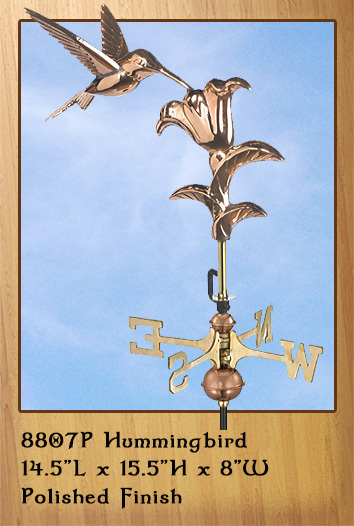 Let this delicate pure copper hummingbird weathervane adorn your rooftop. Call 866-400-1776. 12. Pure copper cottage size Lighthouse and Cottage with arrow. 13. 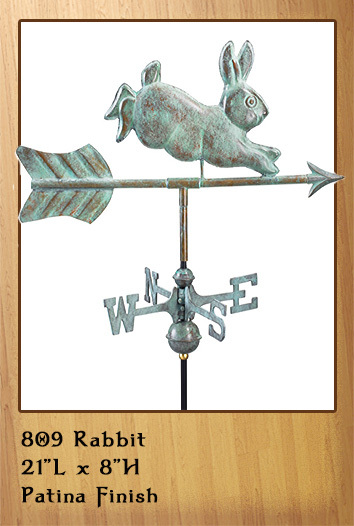 Set this prancing bunny atop your roof, or in your cupola or garden. 17. 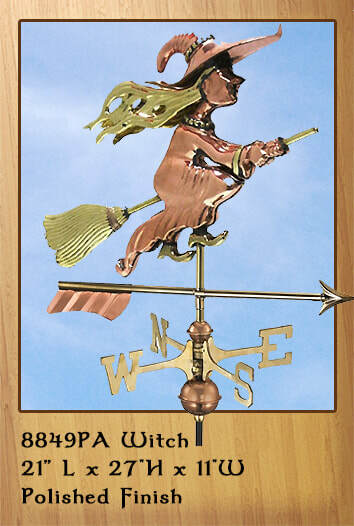 This good witch sails through the sky ready to adorn your garden, deck, or yard. Call 866-400-1776. 25. 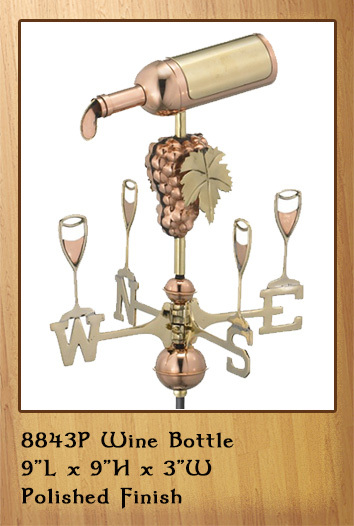 Show off your refined taste by raising this elegant wine bottle weathervane filling four goblets. 29. 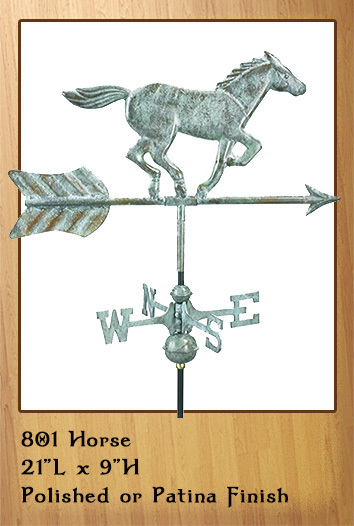 This moose weathervane comes with 3 dimensional antlers. 33. Graceful swimming all copper mermaid weathervane. 14. Another adorable bunny available in the antique patina finish. Call 866-400-1776. 18. 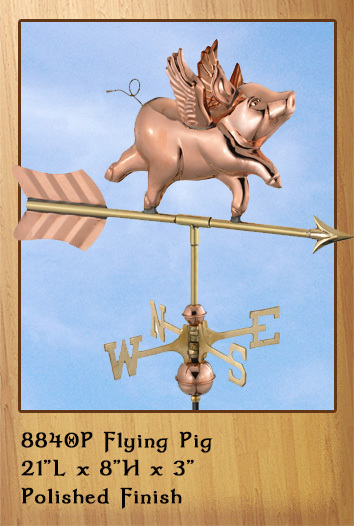 Pig weathervanes were especially popular in rural farm areas. Call 866-400-1776. 22. Here we see an Olde Tyme Golfer with his knickers. 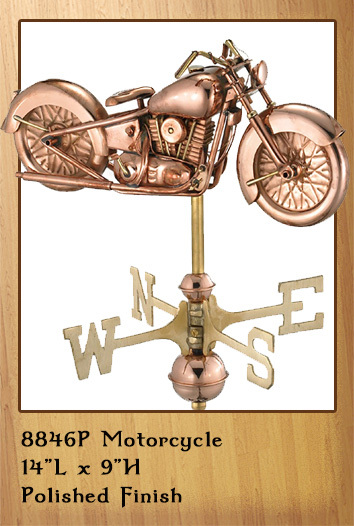 Available in both copper and patina finishes. 26. 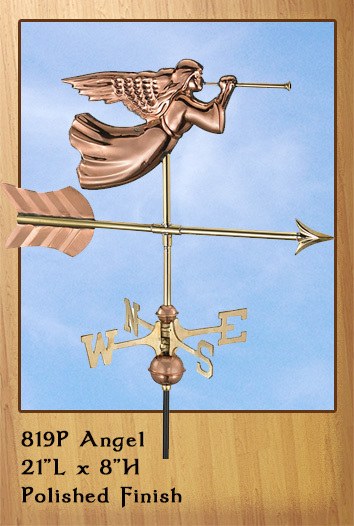 From a mid 1800s design (but originating earlier), Angel Gabriel trumpets good tidings. 30. Prancing deer all pure copper weathervane. Call 866-400-1776. 34. 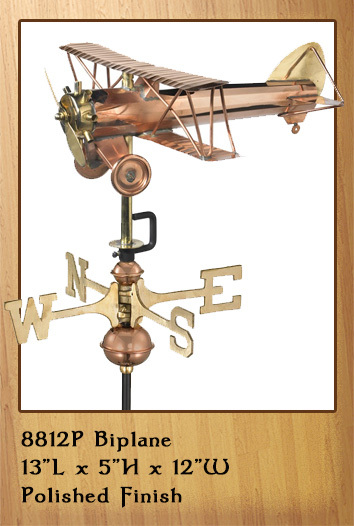 Sun and moon copper weathervane combo with a star. 15. 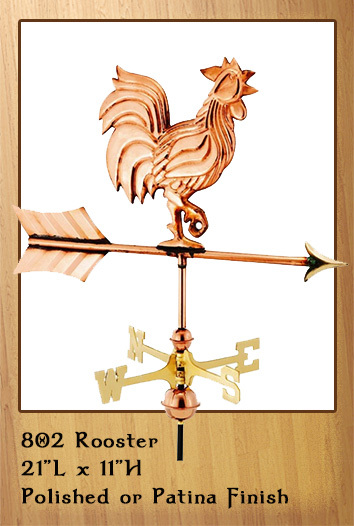 The proud crowing rooster weathervane always looks great. 19. This horse is running all the way to your rooftop or cupola. 23. 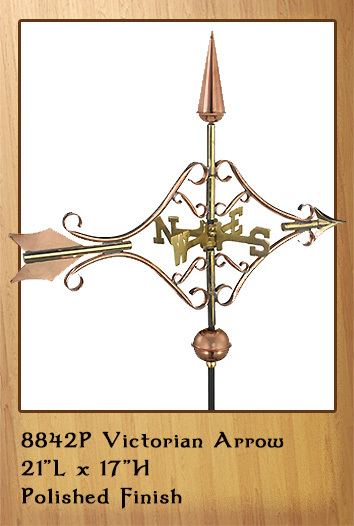 This gorgeous arrow will look striking atop of one of our cupolas making a grand statement. 27. This vintage motorcycles the perfect combination of technology, craftsmanship, and Americana. the U.S. most popular dog breeds. 35. What a beautiful sight with its long curving neck. 16. 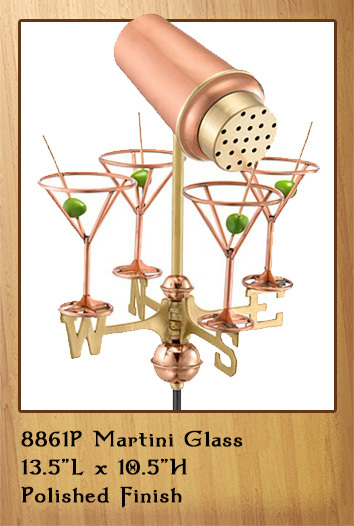 Show off your refined taste with these stunning martini glasses. 20. Another proud crowing copper rooster always looks great. ​ rooftop, garage or cupola. 28. Hovering hummingbird feeding in flight is a coveted sight. 32. This beloved biplane was popular during WWI- later for crop dusting. Call 866-400-1776. 26. An elegant flying goose with a long neck and extended grand wings. 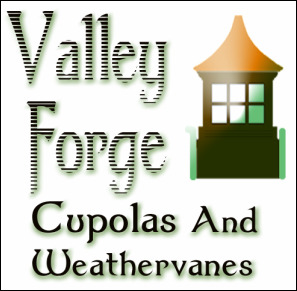 Call 866-400-1776.
gazebo cupola. 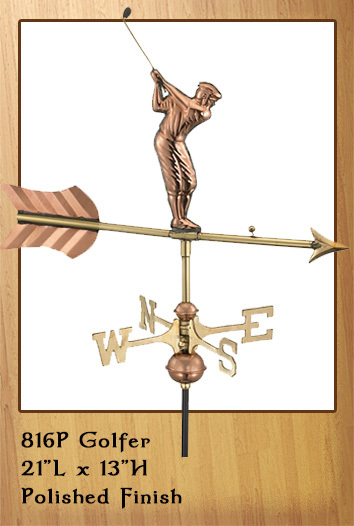 Add any style weathervane or finial on top.